Crabs on the attack in Grimrock. I don’t play a lot of computer games, but I have to admit that ‘Legend of Grimrock,’ which recently came to my attention via this blog, pulled me with its video trailer (see below). They somehow managed, in the few screen shots that I have seen, to make a video game that looks just like I used to imagine ‘the dungeon’ looking when I first started playing D&D so many years ago. Plus, the developers are trying hard to lure in the ‘old school’ players by allowing users to turn off the ‘auto-map’ function and let you map your own way through the maze using paper and pencil. The premise, if I understand it correctly, is simple. You control a group of four prisoners who are dropped off at ‘Grimrock’ for unspecified crimes. 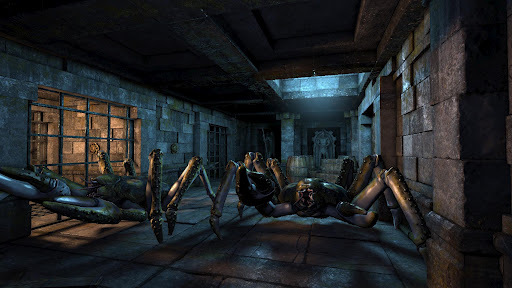 Grimrock is a maze of tunnels, inhabited by monsters and filled with traps and puzzles, and you have to navigate your way through to survive (I think if you make it all the way through, you get out, so it is sort of like ‘Papillon’ but with a dungeon rather than an island). On your way through, you can scavenge food, armor, weapons and other supplies you will need to make it. I doubt I will ever buy or play Grimrock, but I find it probably represents something ‘old’ being new again, and this aspect interests me. Though I haven't been too big on computer gaming these past few years, I have been playing the hell out of Grimrock since it was released. It definitely has an old-school vibe, with devious puzzles and deadly combat. You should think about picking it up. I think you would love the game. I'm enjoying Grimrock a good bit, although so far it isn't quite as gripping as I expected it to be. Then again, I only just got to the third floor so things may pick up even more.